Whether you are punching or hooking to create an embroidered piece or a rug you will need appropriate foundation cloth of good quality. We carry both Weaver's Cloth and Monk's Cloth for your crafting needs. If ordering more than 1 yard of either material it will be cut as one continuous piece. For example, if you wish to order 1 1/2 yards of Weaver's Cloth, click the Buy Now buttons for a Half Yard and a Full Yard. The fabric you receive will measure 54 X 44 inches. (Does not apply to Fat Quarters - if you order 1 1/4 yards you will receive a one-yard piece and a fat quarter cut separately). 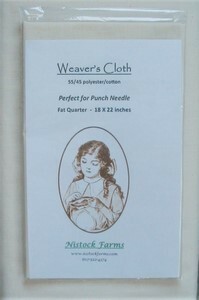 Weaver's Cloth, with its strong, tight weave is perfect for punch needle embroidery work. 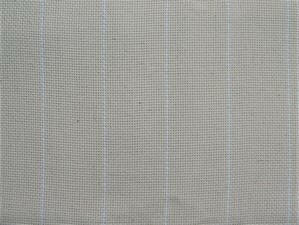 Our Weaver's Cloth (Springs Creative) is a 55% polyester - 45% cotton blend, comes in 'natural' (off white) and measures 44 inches wide. 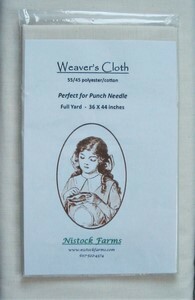 You can dye it to enhance the look of your primitive punch needle work if you wish. Our Monk's Cloth is the best foundation fabric for both rug hooking and Oxford Rug Punching. Sturdy, 100% cotton fabric is light weight, soft and will adapt to all size cuts (thread count per inch 24 x 26). 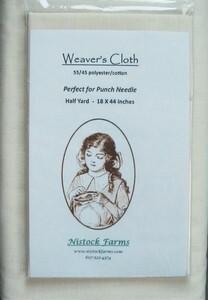 Fabric is 60 inches wide with a useful white warp thread every 2 inches which aids with placing and working your pattern. NOTE* Our website calculates shipping based on the dollar amount of the order. Because fabric will ship in small, light weight packages, rest assured that if your shipping cost is $3 or more under the charged amount we will refund you the balance.